Goat cheese ravioli at Nightwood. When I get a better description, I'll edit my post. The pasta was cooked perfectly al dente. The flavors in the dish just popped. It was not a huge serving as an appetizer, but it would have almost been too rich to have more. Supplemented my meal with a blueberry gimlet made with Tito's vodka. I'd add that to the "best thing I've sipped lately" thread. 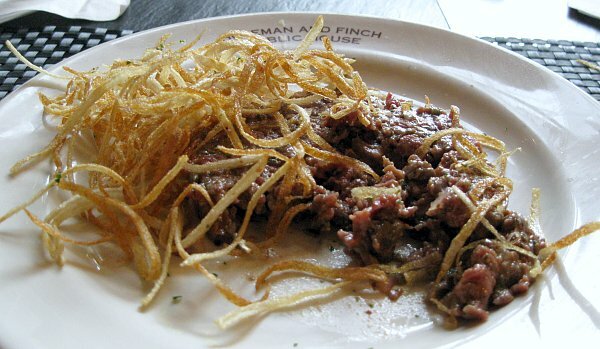 Holeman & Finch is a place not to be missed. They are doing more with whole animal preparations than anywhere else I know, and if my small sampling was indicative, it all rocks. Thanks to jazzfood for the recommendation. I'm not sure if I should post this here, since to be accurate, I'm revealing the best thing I've eaten this year: Birria Tatemada at Birrieria Zaragoza. I'd also like to pass along a little tip from Norma Zaragoza: You can estimate the heat of a fresh chili by pinching it. If it is soft, it is likely to be on the mild side (when compared to other chilis of the same kind). If it offers some resistance, expect medium heat, but if it is hard, be careful! I have not tried this, but I will. I took about 1/2 of my porchetta from Piccolo Sogno home from dinner at the restaurant last night. Had it today on a sandwich for lunch. It was sublime! Loved it--aromatic and full of flavour. Just fantastic and hit the spot. I recently picked up what I believe to be this same blue/pistachio cheese log from the cheesemonger at the Park Ridge Farmer's market, and made a return visit to the Farmer's Market today specifically for this. The name of the cheesemonger is http://thecheesepeople.com/ and they will reopen their online store in November after the farmer's markets have closed. P.S. If you like the pistachio cheese log, you will become weak in the knees when you taste the brie with almonds and apricot jam. The prices listed on the website are per pound. Charcoal-grilled lamb chops, roasted potatoes, and sauteed spinach at Francesco's Hole-in-the-Wall, which is now accepting credit cards. Followed up by a mind-blowing Ahodaga sandwich at Xoco for lunch the next day. The combination had me nearing sensory overload. bellota jamon at Gorria in Barcelona. I had a lot of jamon iberico while in BCN this week, but this was the best: hand-cut little squares, just the right thickness to give a texture like, well, fruit roll-ups, with such a perfect salty, nutty, meaty morsel in each bite. JoelF wrote: bellota jamon at Gorria in Barcelona. So wonderful. Where else have you been eating in Barcelona? See this thread. The restaurant has a rack in the bar with about 50 full legs hanging, and I asked the bartender in my halting Spanish how much a whole leg is. She replied that it's per kilo, but they average around 300 Euros (!!!). I seriously thought about trying to sneak a bit in, but when the cryosealed packs start at about 20 Euros for 100g, it didn't seem worth the risk... and sure enough, there were beagles in the baggage claim, and I bet they can snoot out pork products faster than blow or C4. RAB and I dug for clams this morning in the cove adjacent to our Harstine Island, WA rental cabin. Digging for clams in the mud with rakes was fun and easy. Cleaning the muck off the clams wasn't nearly as enjoyable, but was well worth it. We think these are manilla clams. There are also horse clams, but apparently locals just use them for entertainment - - they shoot several foot high streams of water up from the beaches. 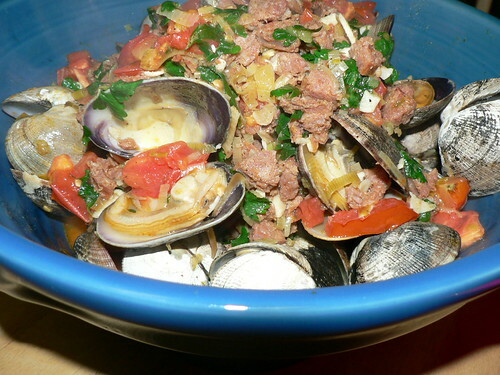 With no decent shopping in sight, we made due with what we'd brought to the cabin and steamed the clams in a sauce of Washington Riesling, chorizo, leeks, garlic, tomatoes, parsley, and Hungarian peppers. The parsley and pepper came from the garden next to the cabin. Chorizo from Seattle's Pike Place market. Tomatoes, garlic, and leeks from a few Washington farmers markets. We'd lucked out by bringing the perfect Italian bread from Seattle - - just the right crust and soppability. Delicious dinner - - we were only sad that half of our bottle of wine went into the clam dish. Braciole from Gianni's Cafe in Kildeer. Not the most difficult dish to prepare, however most restaurants find a way of screwing it up. Gianni's version is old school herb and cheese stuffed flank steak braised in a marinara sauce, then served over linguine. Very tender and flavorful as a result of the presumed long cooking time. I've had this dish at many local restaurants, and this is the best example of it that I have found. Cold lamb and polenta sandwich at Ch'ava just rocked my world. It looked a little unimpressive when it arrived, but it was definitely a solid choice when I bit in. It has a nice garlicky taste that was a bit of an unexpected, but welcome surprise. The meat was juicy, tender and cooked in-house, apparently, which is pretty cool for a coffee shop. Kind of steep at $10, but it's a slow roasted lamb, so the price point that isn't so different from Birchwood. I'm a fan. makemedinner wrote: Cold lamb and polenta sandwich at Ch'ava just rocked my world. It looked a little unimpressive when it arrived, but it was definitely a solid choice when I bit in. It has a nice garlicky taste that was a bit of an unexpected, but welcome surprise. The meat was juicy, tender and cooked in-house, apparently, which is pretty cool for a coffee shop. Kind of steep at $10, but it's a slow roasted lamb, so the price point that isn't so different from Birchwood. I'm a fan. sounds good... what/ where is Ch'ava? I've been experimenting in different ways with grapes over the last few weeks and decided to try pickling after happening on the Smitten Kitchen recipe. I followed the recipe exactly using black grapes from Whole Foods (I thought the farmers market grapes I had were too small), choosing to let the brine cool completely before pouring to keep the grapes firm. These made for the tastiest snack food I've had in a while--mainly sweet with the most subtle pucker. They were a big hit on a cheese plate I served yesterday. 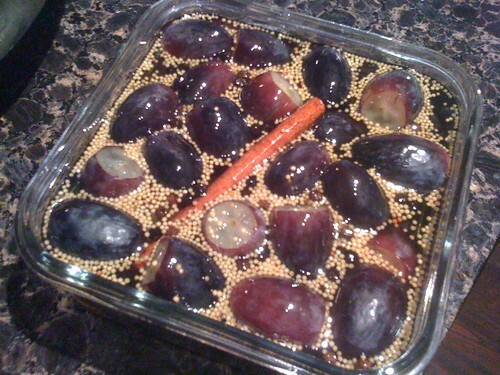 One of my guests noted that she doesn't usually like the texture of black grapes, but that she liked them pickled. I've never paid close attention to grape texture, and I hadn't noticed a change in texture with the pickling, but I guess there was some difference. I will make these often. Several things from the 'Homebrew Dinner' on 10/4 at David Burke's Primehouse; for now, I'll pick the shimp and chorizo cake, served with lightly charred corn and and a roasted pepper viniagrette. Or was it the house-made spiced bacon mustard that came with the beet-cured sturgeon? I know the drink of the night was for me was the I-PAC (IPA with chamomile, grown by the chef) that had a wonderful, seductive baked-apple finish. . . .mmmmmmmmmm. Rick Gresh makes some mighty good food, and even better beer. More on everything else we ate Sunday in the Primehouse thread ASAP. Dandy birthday repast for my CDC. Truffle Parmesan Potato Chips at Delmonico's in Las Vegas. Branch 27 sausage flatbread. Freshly made dough with sausage, black olives, cheese and arugula topper lightly dressed. Just an all out delicious piece of food. The spicy dirty martini is perhaps my most favorite drink in the city. Kettle, hot pepper infused olive juice, with stuffed blue cheese olives.. Sauteed hen of the woods mushrooms over creamy parmesan polenta with truffle oil and red wine reduction from Retro Bistro in Mount Prospect. I could eat this every day. Absolutely fantastic!!! The mushrooms had a wonderfully earthy flavor accentuated by the truffle oil. "When you play with fire, there's a 50/50 chance something will go wrong, and nine times out of ten it does." *I was kind of surprised to hear this called a clafoutis, since I usually think of berries and plums, rather than the fruit pureed with the batter as in this case. 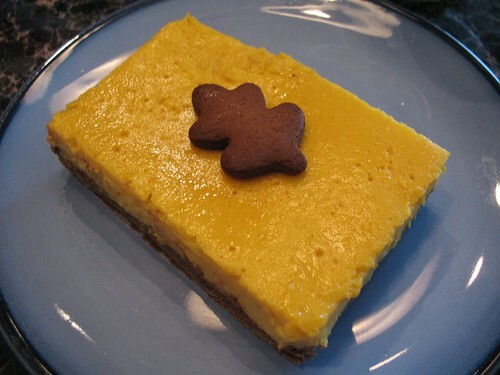 Whatever the name, it was basically a yummy squash custard baked on a cookie. Double yum. happy_stomach wrote: *I was kind of surprised to hear this called a clafoutis, since I usually think of berries and plums, rather than the fruit pureed with the batter as in this case. Whatever the name, it was basically a yummy squash custard baked on a cookie. Double yum. LOL - I was about to get all huffy, myself! girls hamburger kids meal from McDonalds. My daughter loves those little Build-a-Bear toys, and it was my pleasure taking one for my family team. I only go out to lunch maybe 1 day a month, and Lao Szechuan, Katy's, and Fabulous Noodles were calling, maybe next time..if this build-a-bear promotion is over then. After a Saturday morning visit to Old Fashioned for a fritter and some donuts, my two friends and I made our way to Calumet Fisheries, a GNR. We ordered some fried smelts and a variety of smoked fish to bring home. The fellow behind the counter (owner?) couldn't have been nicer and brought out a fresh, hot chub from the smoker for us to eat while we stood there. He then offered to show us the smoking operation, which was underway. While explaining everything to us, the gentleman operating the smoker grabbed a couple of salmon collars off of the heads dangling in the smoker and handed them to us. Hot, juicy, smoky, fatty - what more can I say. It was cold and drizzling, but standing there with oak smoke drifting past us and digging in to unctuous salmon flesh, I was an extremely happy camper. This morning, at El Huarache Chilango at the Maxwell St. Market, had a carne asada "bandera" huarache that was simply amazing. It's called "bandera" because the green sauce, red sauce, and white cheese vaguely reproduce the colors of the Mexican flag. The number 2 best thing lately would have to be the huitlachoche quesadilla I shared with a friend at Green House Steak, consumed only a few minutes before the huarache, and the best thing until the huarache. I'll be smiling about those for a while -- but especially that huarache.